NEW YORK, NY, August 22, 2018 — The Board of Trustees of The King's College in New York City is pleased to announce the appointment of Brig. Gen. Tim Gibson as its seventh president. Gibson brings considerable experience in the U.S. military to this role, as well as a profound investment in the mission of the College. Gibson's career in the United States Air Force involved extensive command responsibilities of organizations at multiple levels, including as the installation commander of the USAF Academy in Colorado Springs, Colo. and as vice commander of the U.S. Air Force Expeditionary Center, Joint Base McGuire-Dix-Lakehurst, N.J., which is the Air Force's Center of Excellence for advanced expeditionary combat support training and education. He retired from the Air Force with the rank of brigadier general in 2016 to become executive vice president of The King's College. Since 2016, he has also served as director of the Center for Leadership Development at the College. In December 2017, Gibson became the College's acting president. Gibson received his commission through the Air Force Academy in 1988 and subsequently earned a master's degree in management from Colorado Christian University and a master's degree in airpower art and science from the School of Advanced Airpower Studies at Maxwell Air Force Base. In 2007, he was a national security fellow at Harvard University's John F. Kennedy School of Government. He has served as an instructor pilot for the T-37 Tweet, C-5 Galaxy, TG-7A motorglider and KC-135 Stratotanker. Gibson's command assignments included the 621st Air Mobility Operations Squadron at Joint Base McGuire-Dix-Lakehurst, N.J., the 71st Mission Support Group at Vance Air Force Base, Okla. and the 10th Air Base Wing, U.S. Air Force Academy, Colorado Springs, Colo. General Gibson's staff assignments included Aide-de-Camp to the Academy Superintendent, director of the Commander's Action Group for Air Combat Command and senior executive assistant to the Joint Chiefs of Staff's logistics director. He served as director for Joint Integration, directorate of Operational Capability Requirements and deputy chief of staff for Operations, Plans and Requirements at the U.S. Air Force headquarters. As a command pilot, Gibson has logged more than 2,600 hours in the T-37, T-38, C-5, TG-7 and KC-135. Prior to joining the administration, Gibson and his wife, Nancy served as members of the Parents Advisory Council at King's. The Gibsons have three children: Jessica (MCA '16) is studying in the Film M.F.A. program in creative producing at Columbia University; Drew is studying physics at the Air Force Academy in Colorado Springs; and Mary Beth is a homeschooled student. For 80 years, The King's College has educated young leaders to integrate their faith, ethics, and morality seamlessly into their lives and careers. 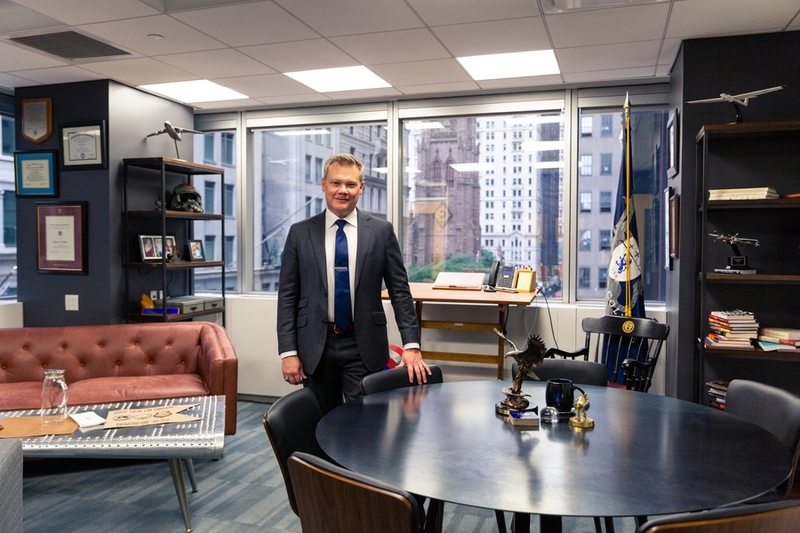 The only traditional Christian liberal arts college or university located in the heart of New York City, King's prepares students for principled leadership around the world. Visit tkc.edu for more information or request a personalized visit by calling 888-969-7200.